This month will mark the end of the Byting Willows Exhibit at 1Spot Gallery. After a successful 2 month showing, the pieces will only be available in a book format when the book is published, either at the end of this year, or next year. This exhibit will also be an important milestone in the gallery’s history, for it will be my last curated group show featuring high caliber, talented, phenomenal artists. I want to thank Katja Lehmann for her hard work, and vision in bringing the Byting Willows exhibit to fruition, and her endless drive and dedication in writing the Byting Willows book. As most of you might know already, my gallery director resigned her position last year in November, and chose to focus on her artistic endeavors as well as welcoming a baby into her family. We want to wish Michelle, all the best with the new changes, and She will also be relocating out of state during this time. I want to thank Michelle for our years of hard work together and all the great collaborative events, shows, projects that have come out of this partnership. Without her help it would have been a lot harder to balance work, the gallery, and my art. She also introduced me to the great and vibrant art community downtown, and helped to cultivate working relationships with some awesome artists and people. What does this mean for the future of the gallery? I will be showcasing more of my works exclusively in the shop, and spend less time curating shows with multiple artists. This will allow me to focus on my art work and to pursue other creative projects and opportunities while maintaining a presence in Downtown Phoenix. I am open to the possibility of continuing to produce the yearly Movie Poster show, as well as another specialty show every year. This also allows me to work with guest curators who want to produce a show with an indigenous artist, or group of artists. I prefer to continue showcasing indigenous artists who do not have a voice or platform here in the city. The availability of the gallery to host special events will also be open, provided that the event organizers take care of all the details. The extra work that I will be unloading from myself will also address my recent health issues. On February 5th I had several heart attack episodes, and thanks to the AZ Heart Hospital, I’m almost back to 100% a couple months later. Currently I’m taking more time for myself, and spending more time doing my art, and the change in pace in my life is welcome. Which brings us to the last show of this season before the Gallery’s Summer Break. 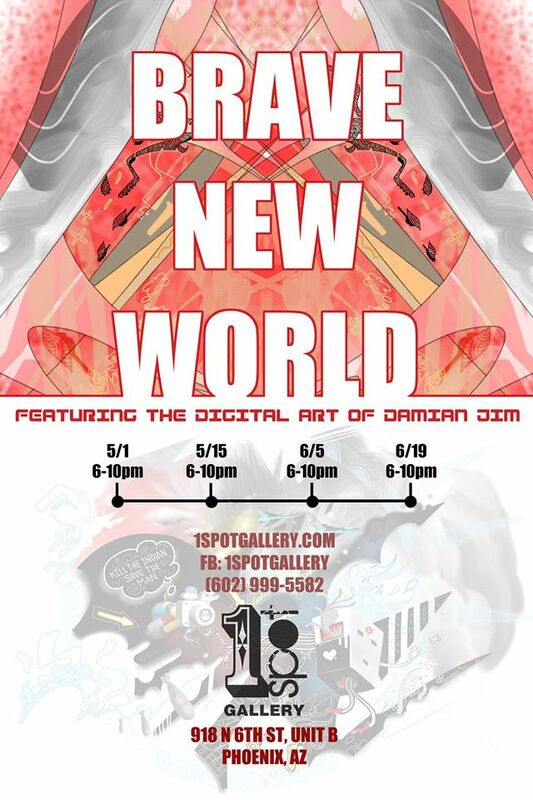 I will be featuring “Brave New World”, an all digital art show with many never before seen or printed works, as well as new work, presented in an all encompassing show at 1Spot Gallery. This show will run from May – June. 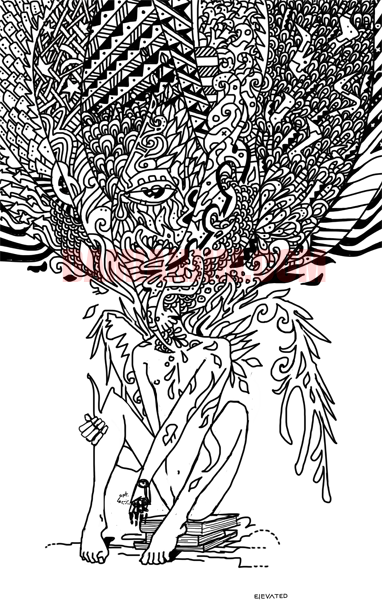 Among the debut of the new paintings, will be several prints from the STOIC line. This batch will portray a few endangered animals incorporated into every day characters, this will be but a small sample of the unique creatures that are on the border line of extinction. 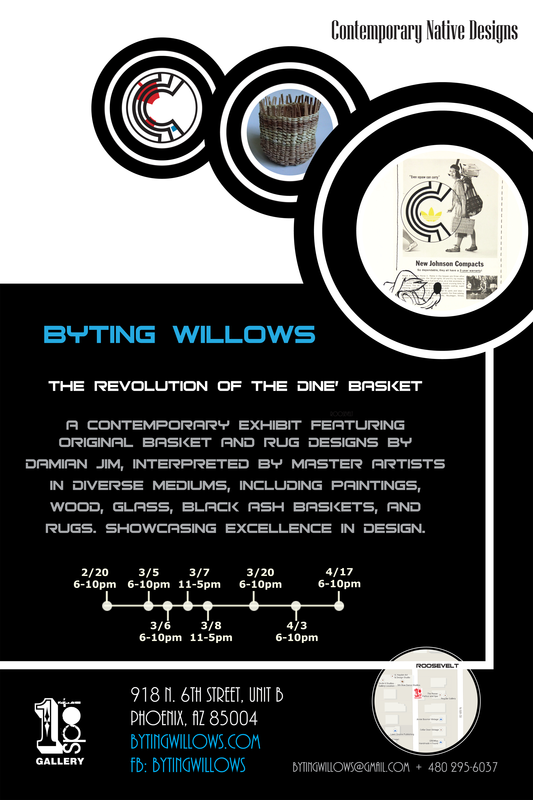 This Third Friday, February 20th, 6pm – 10pm, I will be opening up a new exhibit at 1Spot Gallery, Byting Willows: The Revolution of the Dine’ Basket. The entire project began when I met my girlfriend, Katja Lehmann, and I told her about my idea of publishing a catalogue of the 1,500+ designs I had created for Dine’ basket, rug, and jewelry makers in Southeastern Utah more than a decade ago. During our brainstorming sessions, she suggested that she would curate an exhibition of the best designs being interpreted by other master artists and include those pieces in the book as well. This little spark led to the Byting Willows show that will be presented during the months of March and April, and the pieces that these gifted artists have worked on will finally be revealed to all of Phoenix. There’s something for everyone here, paintings, wood carvings, giclee prints, micaceous pots, black ash basketry, glass works, and a rug. There’s also a limited series of silk scarves, limited edition t-shirts for men and women, and earrings. The entire plethora of work is breathtaking and I’m truly humbled that these artists agreed to work with us to produce this exhibit. The official opening of the project is Thursday March 5th, from 6pm – 10pm, during which we will have our awesome friend Byron Fenix keeping the crowd moving. As an added bonus, Warbird Press will have a vending machine set up offering printed goodies (bring your quarters). That same weekend Art Detour will be in full swing, and due to scheduling conflicts 1Spot Gallery was not able to make the printed map, but we will be open on the 7th and 8th from 11am – 5pm for Art Detour devotees. 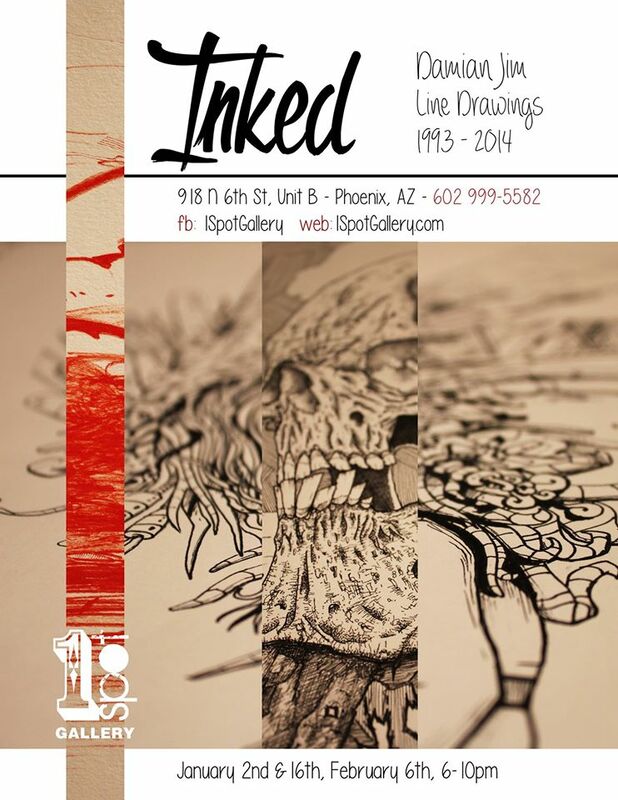 That same weekend will also mark Paint Phx’s 2nd annual celebration of all things aerosol. 1Spot Gallery will be participating by having world-famous artist, Randy Boogie Barton re-paint the front of the gallery. And although we officially turned 2 years old in December, our awesome neighbor Andrew Pielage’s gallery the Drive-thru Gallery will be joining us in a public BBQ to mark both our gallery birthdays. With so much awesomeness in 1 weekend, you “need” to come to Phoenix that weekend and partake in the festivities. September is a cooling off time here in the Valley, and the cooler temps bring out all the Phoenicians like ants after a heavy storm. The Fall season at the gallery is also a time of new exhibits and returning shows. This year, 1Spot Gallery is bringing back our movie poster show with “Not Yet Rated 2” The requirements are on the Ziindi site, as well as on our facebook page, Indigenous artists from the world over are encouraged to submit your art. The book project “Byting Willows” is also progressing, and I don’t have any new pics to share, but we did discover quite a bit more original drawings back from 1995. We’re going to take one of those drawings and include it in the show in March. 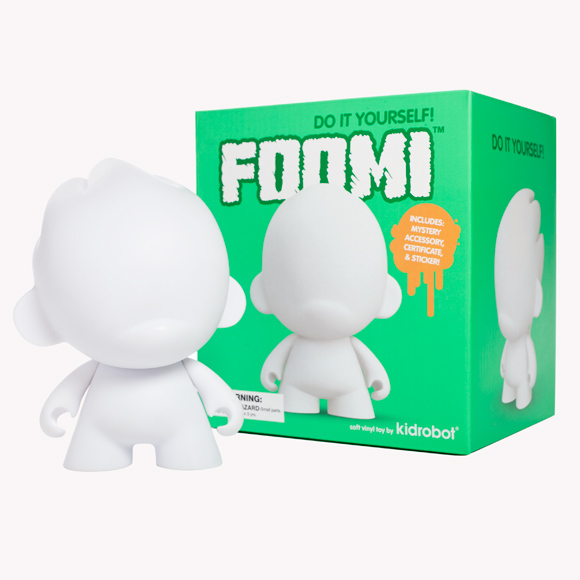 I’ve also been productive as usual this month, producing new ink drawings, along with working on a pair of Foomi’s. And I also finished two paintings as well. The first finished painting is titled “Read Between the Lines”, and is a piece on giving voice to the indigenous people who have no platform to voice their opinions. Subtle statements and opinions on land, sovereignty, and equal rights are written over a multi-colored background. I used spray paints, oil markers, and acrylic for this piece. I finished up this painting in the early morning hours, and after completing this and stepping out into the quiet night and the neighborhood, it was a welcome catharsis to the anger I had when I entered my studio. The next piece I completed is titled, “The Burden of It All”, and contains spray paint, marker, and acrylic. Originally a darker piece, I tried using colors I normally don’t use and made the painting pop better in the process. Some of the paintings I create have a lot of emotion in them, and I decided to show that in the title. Also of interest is the use of gold paint in this piece, it accentuates the yellow nicely! This month I started sketching “Do’ Tso'” again, the translated title means “Big Fly”. One of the Big Series paintings that I have on the back burner, I was stuck translating the sketch to the 4′ x 5′ canvas, and I had left it leaning up against my wall for over several months. Usually when I hit a block like this on a particular canvas, the solution comes into my head either several; days, months, years later. In this case I was lucky that it was several months. My original study for this drawing depended on surreal human aspects for the main character, as well as using grasshopper limbs as the legs to the side of the body. However when I was scaling the study up, I saw that this approach wouldn’t be as dramatic on a grander scale. Hence the block. Over the past weekend and week, I resolved the crisis of hand/imagination, and am now nearly done completing the full outline of the painting. 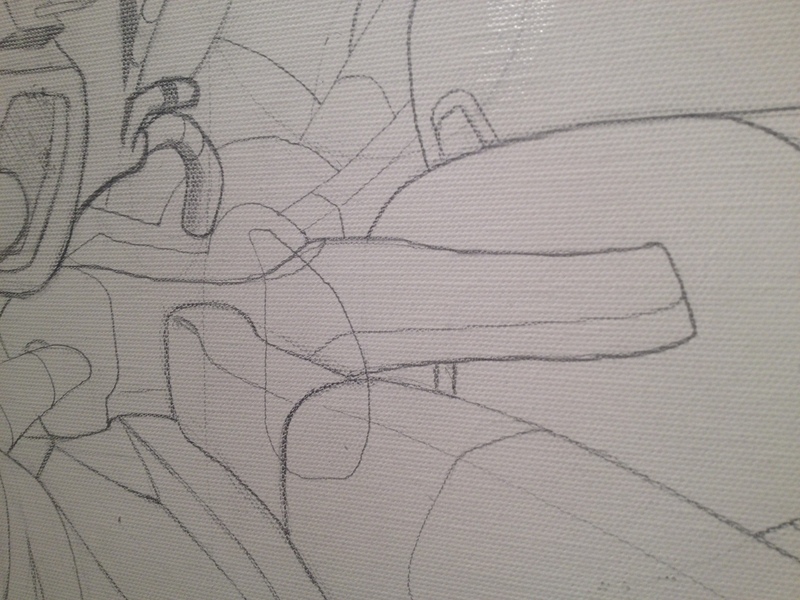 Leaving nothing to chance or on the “fly” painting, sketching the full idea out makes painting large works easier. I hope to get to the color phase by next month, barring other projects I have on my hands currently. 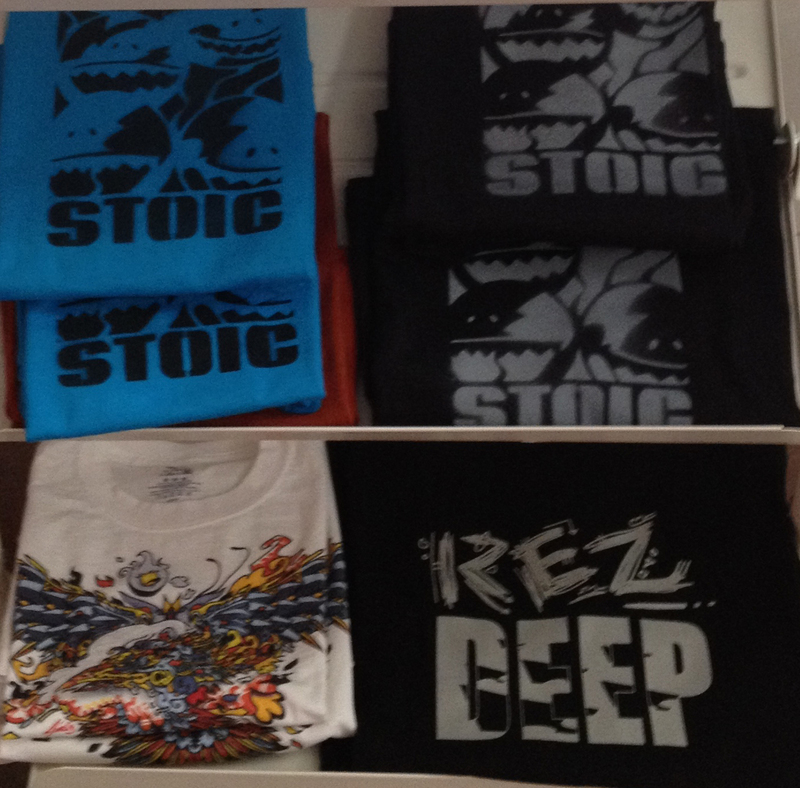 Another side item, I recently completed some new t-shirts using the new STOIC logo, a limited run of 6 dirty print t-shirts. Check them out in the Gallery when you stop by, the sizes are small, smaller, smallest, so maybe for them young chilluns. Right now, my stock of Phoenix shirts is low, and I only have two shirts left, and I also have Rez Deep shirts still available. As always, thank you for listening/reading/scrutinizing/supporting my art and I’ll update you on the status of all my projects next month! What a grand month it has been!! This post will be packed with plenty of goodies to digest, so hold on tight as we cover what’s new on the art/travel front of yours truly. First off, I wanted to showcase the commission pieces I completed last month, these were both for the Maricopa County Treasurer’s Office in downtown Phoenix, AZ. The first commission was adding new pieces to an existing painting I had completed several years ago. “Sacrament” was created during my heavy geometric phase, and was purchased by one of my co-workers. 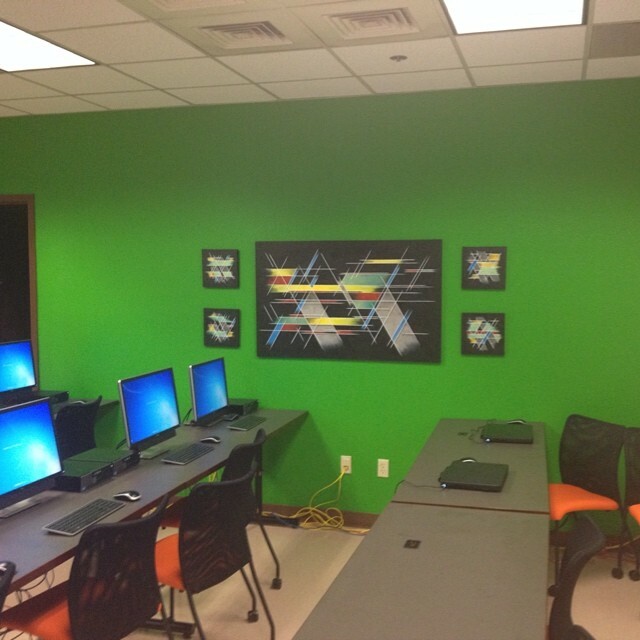 The painting hung in her cubicle for some time and when the new training room needed some art to make the room more inviting, she volunteered to have the piece displayed in the room. The county wanted to add more pieces for this room, and decided to offer the job to me to add more pieces to this painting to complement the piece. The new pieces were fun and offered a little bit of a challenge, since I had to remember which colors and methods I had used in creating the older piece. The completed works meshed with the original piece and these now hang proudly in the County Admin building. 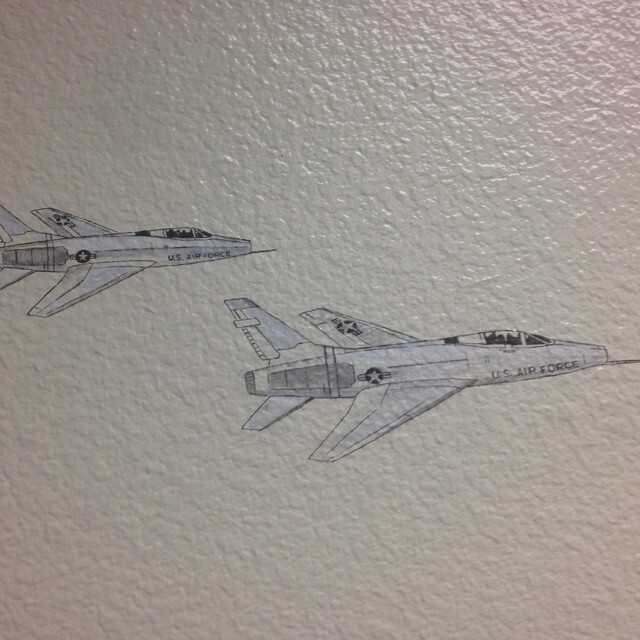 The next piece to be completed for this job involved creating a pair of jets that were inconspicuous, and yet painted directly on the wall. The location for this painting is also in one of the conference rooms, and in this case, I had to deal with a couple factors. First off the wall was heavily textured, which became interesting when I started doing line work for the fine detail. Next, while I have done technical art before, I hadn’t really done any reproductions of mechanical art, and this was a great opportunity to take what I had learned in graphic design school and drafting and apply it in a real world application. Overall, I’m pleased with the results and was happy to do these new pieces. 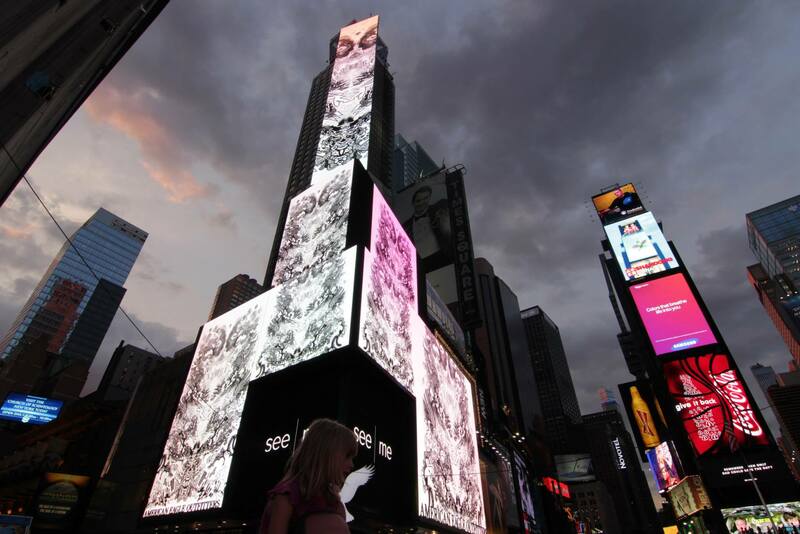 The next exciting event that happened occurred during my trip to Germany (more on that later), where I was provided the opportunity to show a couple of my pieces on the big screen in Times Square. The vehicle that set this showing up was See.Me, an creative support/sharing site that gives different artist the opportunities to show their work on a national scale. The event occurred on July 24th, from 8pm to 9pm, and was attended by many artists as well as the creators of the site. “Mea Culpa” received the bulk of the promotion as it was displayed across all the screens that were used for this event. “Leather Wistfulness” was also displayed, but I haven’t been able to find a picture of that piece yet. While I was not able to attend, the organizers were kind enough to photograph the whole event and the album is available on Facebook if your interested in viewing it. A big thank you to See.Me and to my supporters who were able to vote and help make my art visible in New York for one night. While this show was happening I was in Germany! Thanks to my girlfriend, we had just flown into Frankfurt a couple days before, and were in Phorzheim when all this was happening. The 10 day trip was well too short, but we packed in a lot of museums, castles, cuisine, churches, and walking while we were there. One of the highlights of the trip came during the first few days of the trip in the form of Pretzel bread. 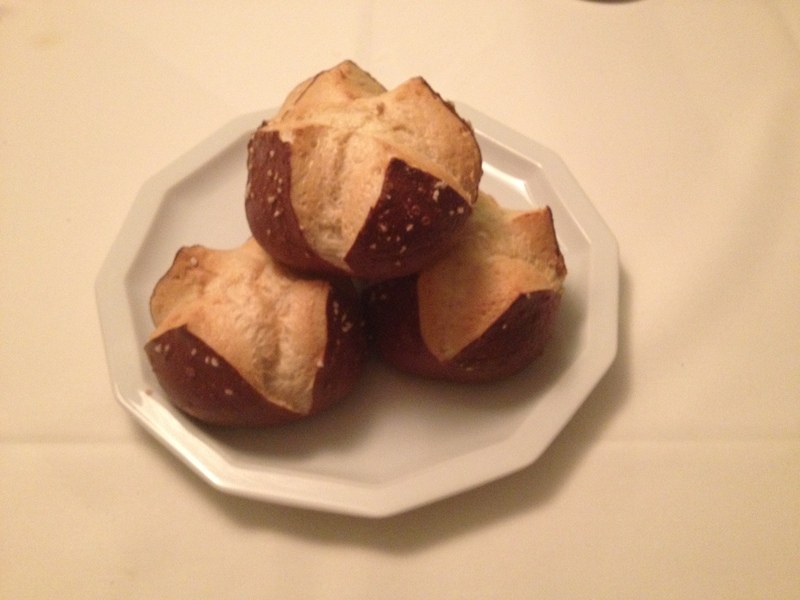 The Pretzel bread from Pforzheim is well known, and I could see why. During our trip, we never came across another variety that came close to the dough texture, taste, and experience that came with each bun. A truly worthwhile experience I will have to repeat some day, but for now it will remain a favorite memory of my tastebuds. We ate many breads during the trip, but this roll was hands down, the winner of all of them. 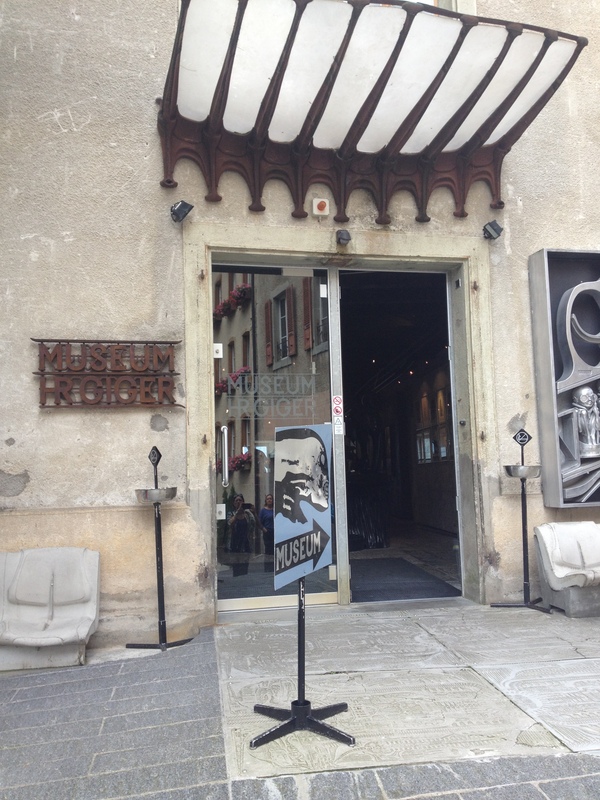 We also made our way down to the Giger Museum in Switzerland, and it was a mind blowing experience. The size of some of his works, the layers, and the immaculate attention to detail made each painting a joy to behold. Unfortunately, photography wasn’t allowed inside the museum, and I only have a few photos from the retail side, as well as a few pictures of the bullet baby and staircase outside. The man was truly gifted and his museum pays homage to not only his talent, but also to his intense creativity and ability to present his vicious imagination onto canvas. The trip was well worth it, although if you do go, stay away from the food in Switzerland, it’s way too overpriced and if you want to get get good cuisine, you have to pay a lot of money for it. I stayed busy while on the road, and completed 3 new paintings, and started a new painting as well. 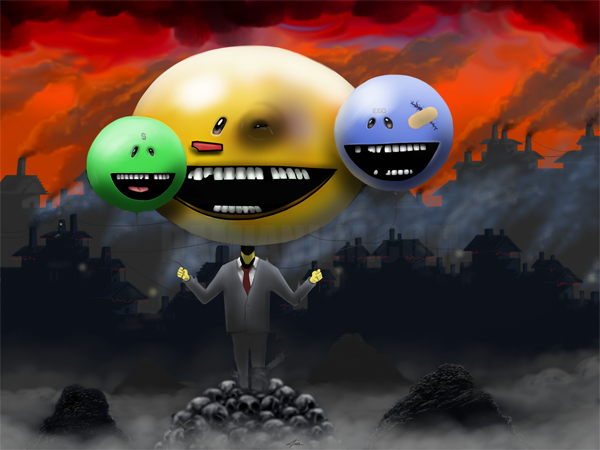 The first piece I completed was “The New Paradigm“, a new digital painting that I will have available as a digital print. I really took the time to add a more highlights and shadows to this painting, while breaking up the monotone backgrounds with light splashes of color to accentuate certain features of the painting. 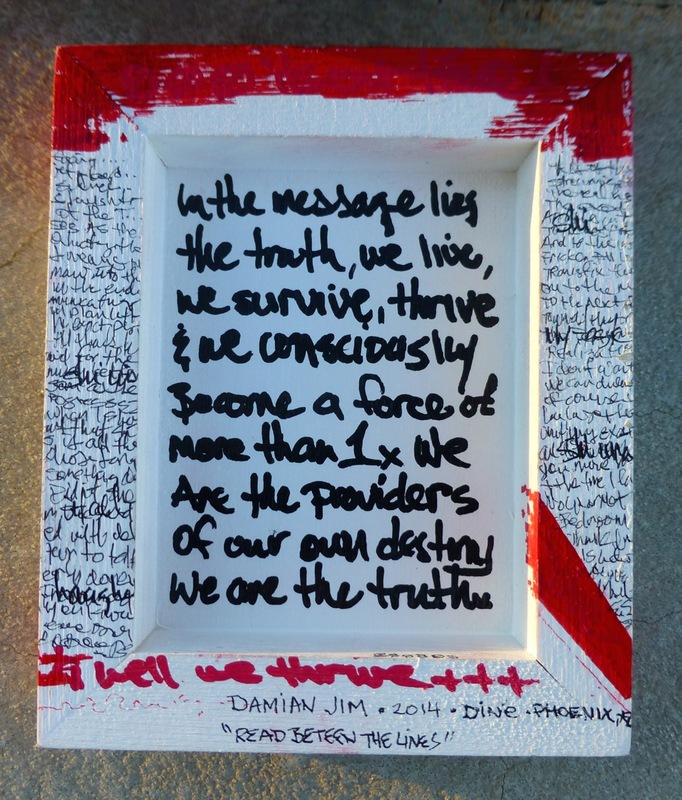 The quote in the painting comes from Richard Henry Pratt, an officer in the U.S. Army who also helped to develop the ideology and structure for Carlisle Indian School. The model he used for Carlisle, was later adapted by other schools for cultural immersion and assimilation of native kids. The next piece I completed on the road was “Arachne Rising“. 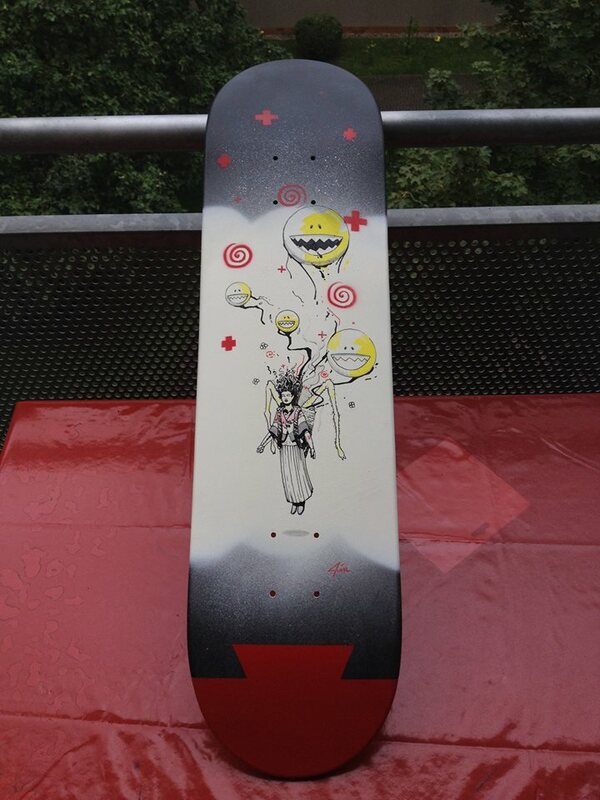 A spray paint, acrylic, pen, pencil, commission piece for a new friend in Mannheim, Germany. We actually had to find several stores in Heidelberg to complete this project. We had to find a store that sold spray paints, check, we had to find a store that sold skate board decks, check, and last of all a store that sold art supplies, check! The concept is based on a previous painting of Spider Woman I had done, and this version is referenced as the Greek goddess version, hence the name Arachne. I chose to have my vicious smileys coming from her basket along with the swirlys and Spider Woman crosses. 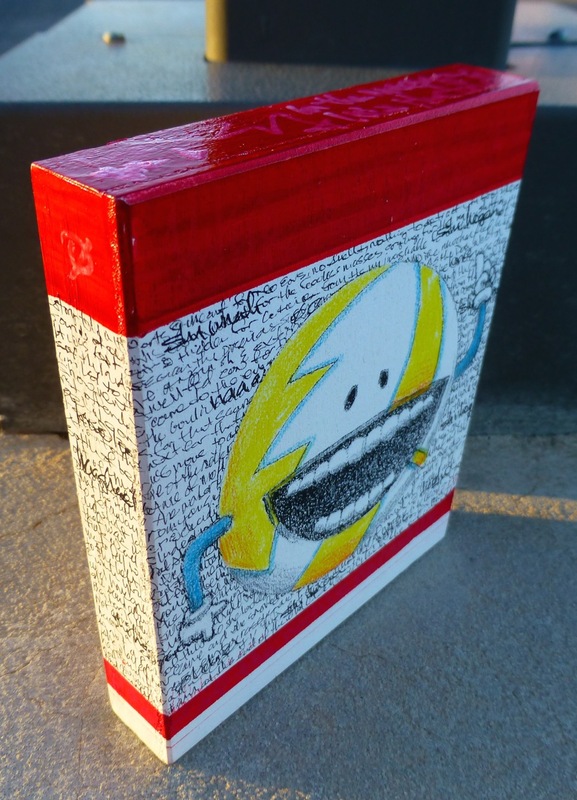 This project was fun and it also showed me that I could paint anywhere, just give me the supplies that are present and I can make you a painting! The next painting I completed was in Gross-Gerau, Germany. 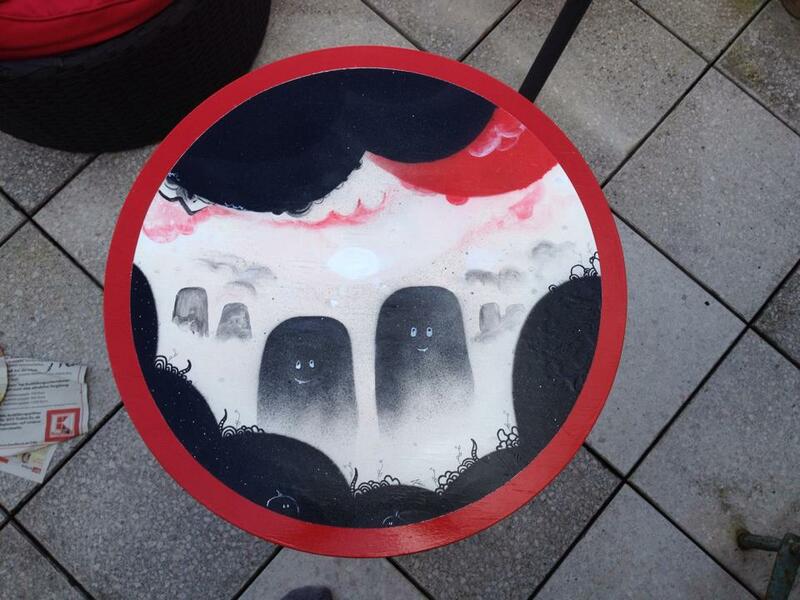 The surface I painted on a was an heirloom wood table for another friend. 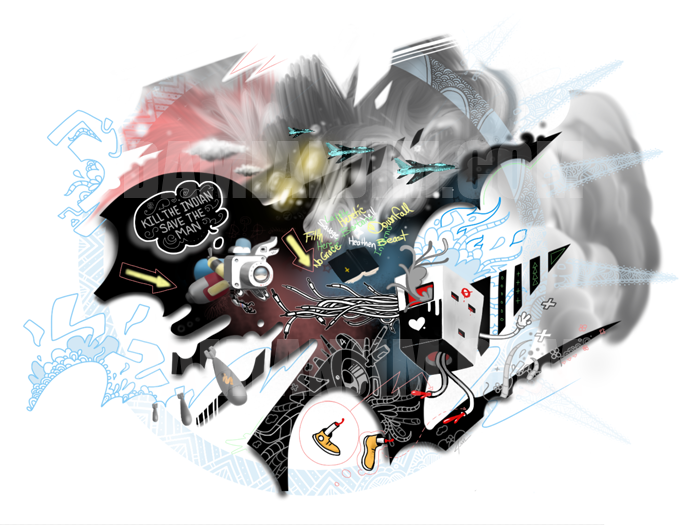 She wanted a piece that was positive, and yet showed my existing art themes. The project was completed in one day, and despite some problems with the humidity and running paint, I was able to complete “A Shared Thought“, using spray paint, acrylic and pen. The final piece was then varnished to protect it and came out beautifully! All in all the trip was way too short, and having coffee at small cafes, checking out all the killer graffiti in every city, to hiking up tons of stairs to see all the cool architecture, to walking actual castles, and soaking up the culture, land, and cuisine. The Germany trip was awesome!!! And now onto Santa Fe in a few weeks, I hope to see you there, and if your an artist, ask me about the collaborative show in March!! Here are a few more panoramic pics, one of Heidelberg Palace, and the other Gruyere, Switzerland at the Giger Museum, enjoy and thank you to my girlfriend Katja, her parents, all her generous friends, Brotzinger Art Gallery, and my supporters for the event in New York!